If you haven't seen the previous blog post you might want to jump back and read it. It gives the background as to why I'm sharing all of these fun and fabulous house blocks. For those who know let's continue our walk around Daisytown, the neighbourhood of colourful houses from around the world. 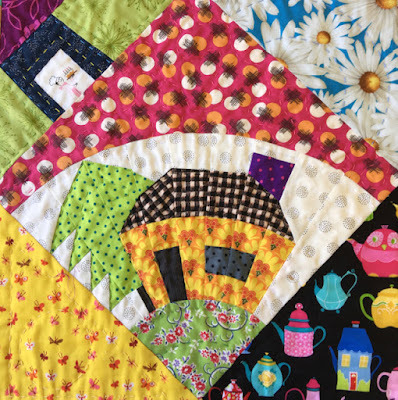 Today we're starting with this wonderful foundation pieced block made by Chris Jurd. One of the fun things about my invite to make houses was that there were no restrictions on the size or style of the blocks. Chris thought outside of the square and turned her square on an angle. For the quilt I did some landscaping and added a butterfly garden in the bottom garden and planted daisies in the top garden. A corner of teapots because Chris always greets you with an offer of tea. 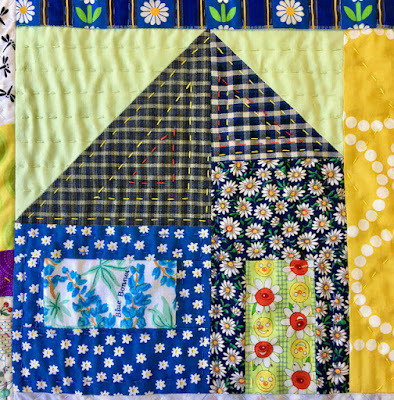 I made sure the house teapot was there, it is a quilt of houses after all. Chris bakes great cakes too so I added a little chef in a cubby house. Chris wasn't the only person to send a block on point. Karen from Just Purrfick sent this clever block. 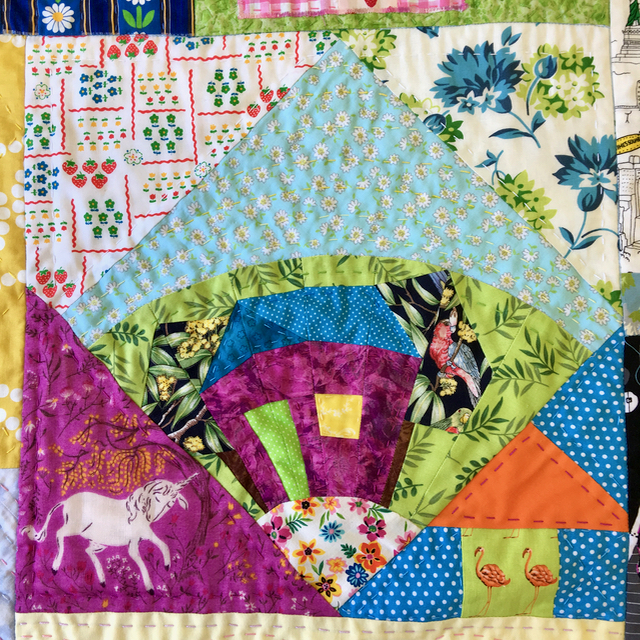 I added fruit gardens, cornflowers, a cubby house with flamingos and a unicorn in the front yard. Karen made a second house with lots of fun fussy cutting. I love the way the front door says "sparkle". Beth of Smazoochie sent this wonderful house of blue daisies. In the window she has Blue Bonnets growing. 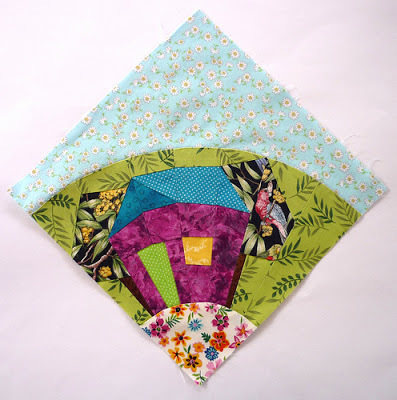 I learnt that Blue Bonnets are the state flower of Texas where this block travelled from. Sujata of The Root Connection sent a house that is a festival of colour and movement. Melissa Peda of 100 Billion Stars came up with a special house design. 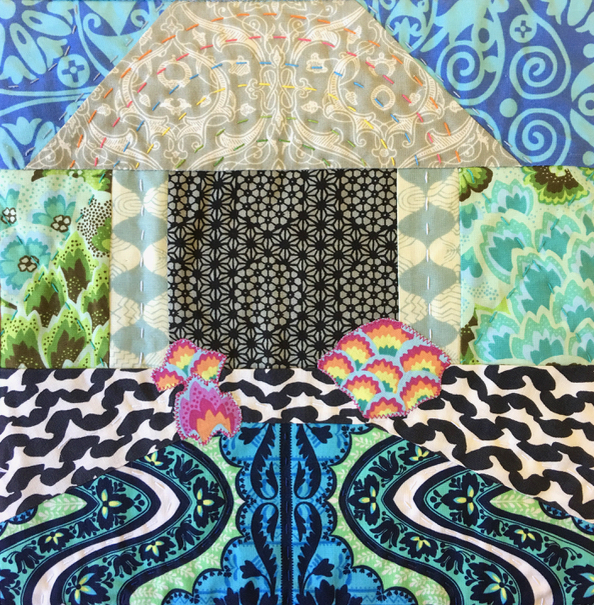 She then made 3 different versions using fabric designers whose fabrics we both love. 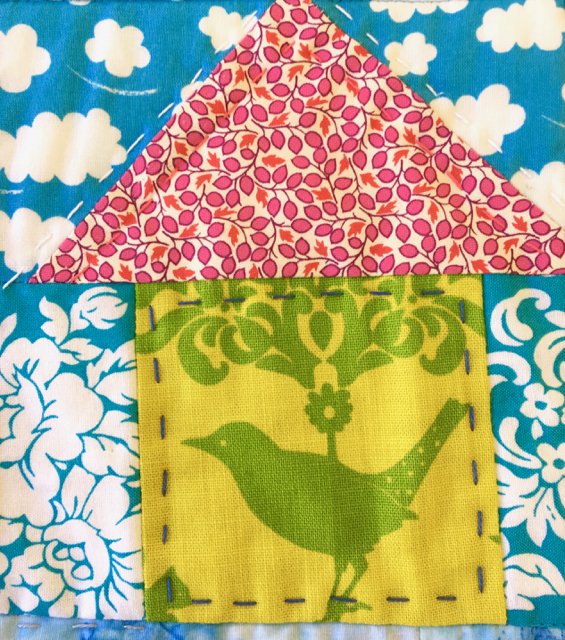 Its really interesting to see how different fabrics can really change the look of the block. 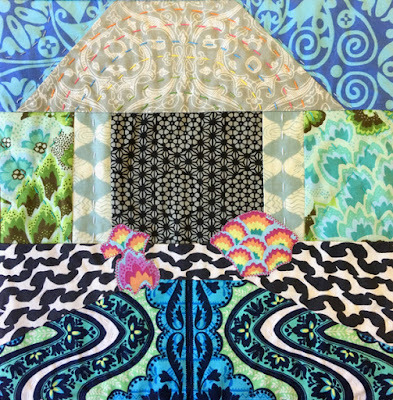 A wonderful combination of Amy Butler and David Butlers fabrics. 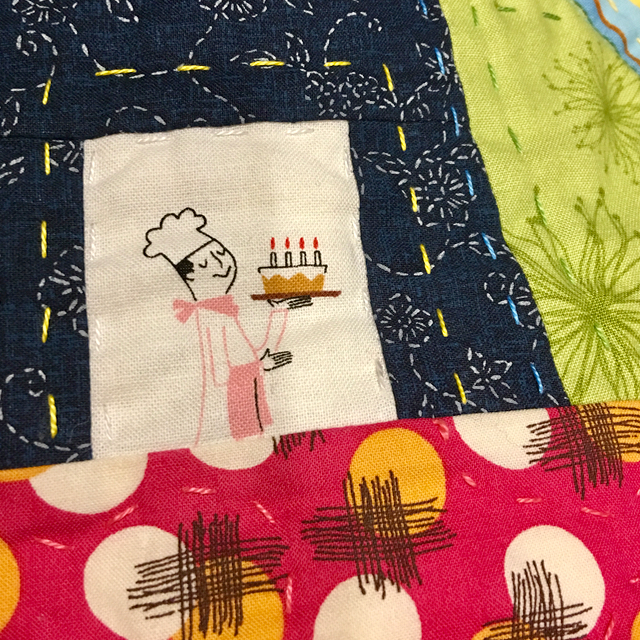 It's a bit hard to see in the photo but I quilted a rainbow of stitches on the roof. The Sis Boom house. Melissa and I met through our love of Jennifer Paganelli fabrics. 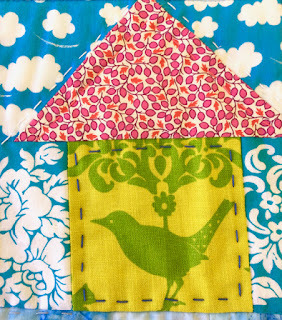 To finish off here's one of my little houses with a selvedge door and lots of birds in the garden. Its easy to find out more about these lovely quilters by following the links. Karen of Just Purrfick, Karen doesn't blog anymore. Thanks Rachael for showing my block. That all look great. Cute, cute, cute! I'm totally in love with your little houses. 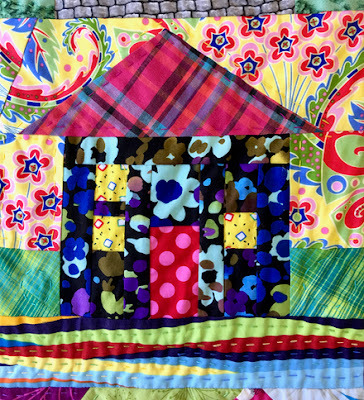 Every house reflects the quilter's style just for you. 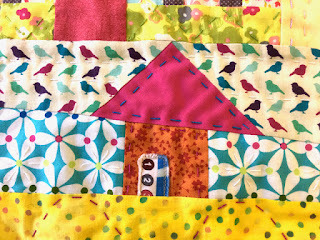 I'm having lots of fun sharing all the love and friendship in these wonderful house blocks. fun tour of some special blocks. The fan house blocks are so so cute. 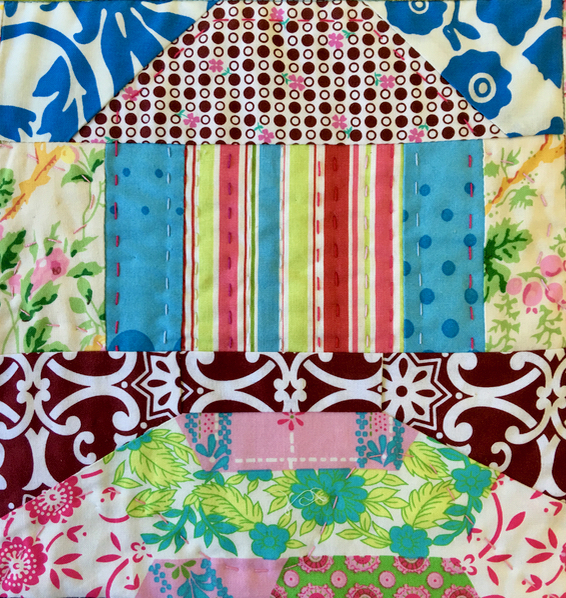 what a fun swap quilt you have! Exquisite on point blocks, love the skew whiffiness of the houses - inspired ! Houses ! Houses ! 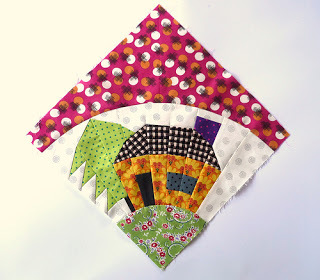 What fun and beautiful blocks you have Rachael ! ooo la la...houses give me such comfort...great post.. Looking forward to the next post ! Such happy blocks ! 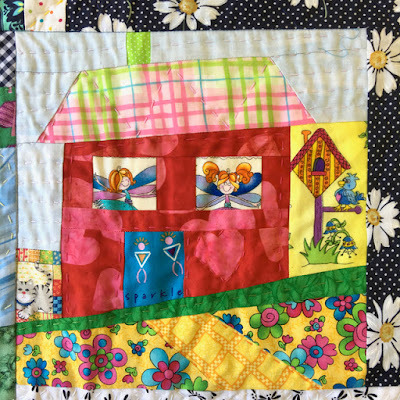 I really enjoyed reading your first blog posts and discovering the quilters behind each house. I'm looking forward to reading more ! So many cute houses. I love them all. I enjoy all the houses and love the additions - or extensions - that you have made. What an amazing collection of little houses. Especially love the two on point ones, so clever! Every one is so differnt and I like your additions to each block. I can imagine gazing at the finished quilt and constantly noticing something you hadn't noticed before. What a wonderful neighbourhood! 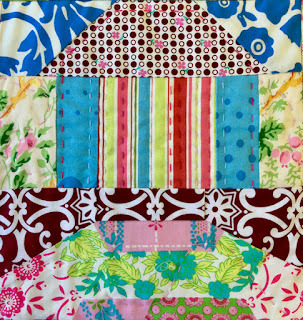 Such a variety of houses and I like how you've used appropriate fabrics with each one. Daisytown is rather lovely with all its colorful and unique houses; I enjoyed the walk around the neighborhood!! Ah! There's it is! I'm sorry I missed it. 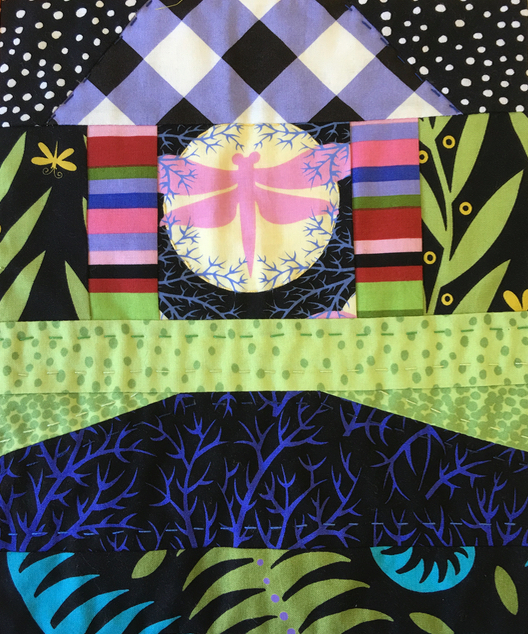 This will be such a sweet quilt!